Serve the same meal for all people in the family – little ones included. Whatever the adults are eating, should be on the kids plates, too. This necessarily requires that the parents are eating in a healthy way that reflects the eating habits they would like their children to develop. 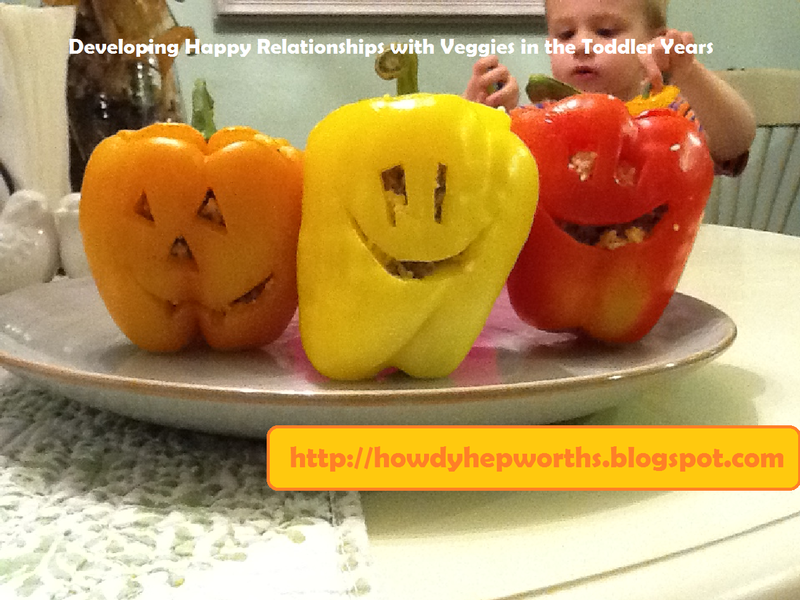 If you won’t eat your veggies, how will your children learn to eat them? Be the example – and lead out on eating well. Cut out processed food for snacks as much as possible – Cheez-its, Goldfish crackers, and gummy fruit snacks are delicious, but they also reduce your child’s appetite for healthier foods. As a general rule, choose pretty boring processed food if you do have it around. The fewer ingredients listed on the box, the better. The fewer foods you eat from boxes, the better! We make most all the bread products around our house, but we do keep a few processed cereals around: plain shredded wheat, Grape-nuts knock-off, Oatmeal Squares (our “sugar” cereal), and plain Cheerios. See? Super boring. For snacks we do: string cheese, raw fruit and veggies (baby loves munching on carrots, celery, cucumbers, peppers, and sugar snap peas right along with big brother – it helps with teething), nuts like almonds or pecans, raisins (occasionally craisins), no-sugar-added applesauce, plain whole Greek yogurt with a little fruit and granola on top, 100% fruit leather. The veggies/fruit are generally snacked on with hummus or peanut butter or nothing at all. Serve fruit and/or veggies with Every. Single. Meal. Even if they didn’t like a certain veggie one time, doesn’t mean that will always be the case. Those kinds of things can change from meal to meal with toddlers. Just keep on serving them. If they aren’t on their plate, they don’t have the option to become better acquainted with them and to grow to like them. You can do the "Deceptively Delicious" thing and hide veggies in their breakfast muffins or in your casserole or pasta dish. That is fine. But it’s important that the kids learn to eat their veggies straight, too. Mix it up. Have a diverse meal set up for them so that they are able to get their grains, fruits and veggies, dairy, and a little protein – but also so they have some choice about what they do or don’t eat on their plate, but DO set some limits. It’s pretty normal for a kid to whine for more cheese, or fruit, or bread. I don’t give my kids extra of those things unless they have eaten everything on their plate. I simply tell them (well, my 2 1/2 year old anyways), “If you are still hungry, then you need to eat everything (or at least 3 bites of your veggies) on your plate, and then I will give you some more bread,” or whatever it is they are asking for. Sweets are not offered as dessert unless I feel they have eaten well enough at dinner – this is not announced to the kids to try to get them to eat a certain way, it is just observed and then offered or not offered. Sweets are rare but they might be something like a small scoop of Breyer's ice cream, or a graham cracker and a cup of milk, or half a cookie. We don't let our babies have sweets until their taste their first birthday cake. Keep kids beverages limited to water or whole milk. Save juice (and make sure it is 100%) only on rare special occasions - like once or twice a month when you have someone over for dinner, or apple juice if they are constipated. Get your kids involved with the food prep as much as possible. Sometimes this one is a little difficult, especially when you're on a time crunch. But during the day I really try to include my kidlets in the process by letting them help scoop the wheat and watch it grind up in the wheat grinder, or to see the carrots getting chopped up in the food processor for the muffins (These ones are delicious! Oh, and these ones too. ), and to taste and identify the different veggies I cut up for Daddy's lunches. Prep your veggies in large batches so they are easy to grab for snacks. If they are already cut up, they are more likely to be eaten and used. Just keep them on a platter or bowl in the fridge and you'll be good to go when snack or lunch time arrives. These awesome sweet potato burritos*, with some “leaves” (spinach and cherry tomatoes with some poppy seed dressing or homemade vinaigrette) and some grapes. I make the recipe even simpler by stirring the baked sweet potato or yam right in with the bean mixture. Then I freeze half of the mixture, so it is already prepared and ready to be thrown in burritos for another day. Pasta with pesto, cherry tomatoes, small chopped sweet peppers, and a little feta cheese sprinkled in, with a cutie (mandarin orange) to complete the meal. Brown rice and pinto (or black) bean burritos (with cheese and/or sour cream, if desired, which it usually is), with raw veggies and half a banana. I cook up my brown rice with Sprouts' store brand awesome vegetable broth, a couple of cloves of fresh garlic, a little salt and dash of canola oil. Delicious and very well received by the kidlets. Couscous and Sausage stuffed Bell Peppers (with faces – for Halloween – or just because they are kids and will absolutely love it.) :) - Pictured above! 1/2 pound pork sausage crumbled and browned, cooked with a box of couscous or plain couscous with your own seasonings added. Stuffed gutted and carved peppers and bake at 350*F for 20-30minutes depending on how crunchy you like them. Quesadillas with mozzarella cheese and a thin layer of hummus spread on half the quesadilla (served with some mango-peach salsa and sour cream), no-sugar applesauce, and a handful of sugar snap peas. Peanut Butter and Jam sandwiches on homemade whole-wheat (soon to be multi-grain) bread and the E.D. Smith low sugar preserves from Costco, with a string cheese and some carrots, celery and hummus. *I like to use the uncooked flour tortillas from Costco for my burritos and quesadillas. We switch it up and do corn tortillas sometimes, too. What do YOU do to help your kids establish healthy habits with food? Have you read Bringing Up Bebe? It's French take on raising kids. I didn't really get into the whole book, but the section on getting kids to eat well was very similar to your blog and I did like that. My kiddo eats better than most adults I know: at age 2 he loves all different kinds of food- pretty much anything you set in front of him. It really is because we never gave him kid food. He has always eaten what we've eaten. I think adults tend to make kid food really bland, boring, and repetitive, which if kids get used to have, flavor and newness scary. Another thing that book suggested is serving a separate vegetable as a first course. That's when everyone is the hungriest, so it will be easier to get veggies in at that time. That really worked for everyone in my family. :) Love the post!